In February, I shared 10 books worthy of multiple reads. 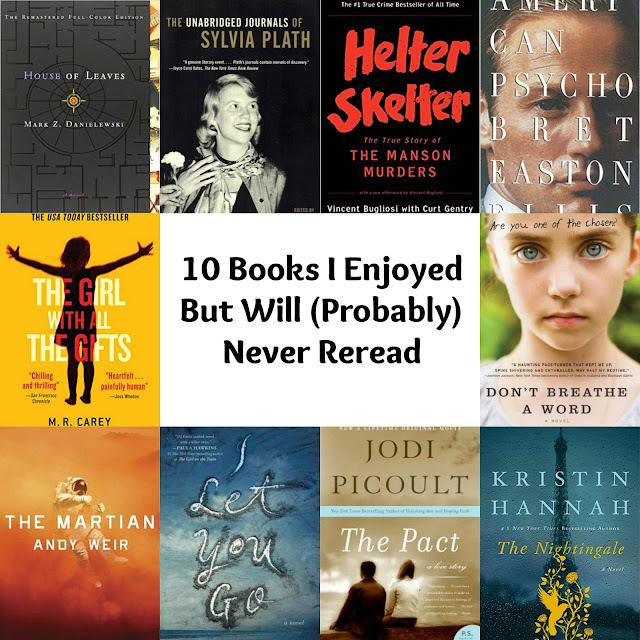 Today I'm approaching the idea of rereading in a different way by sharing 10 books I enjoyed reading but (probably) don't ever plan to revisit. I like to add in the "probably" because I don't actually know that I'll never reread these books. 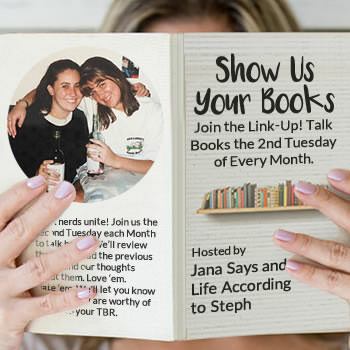 I could join a book club that happens to choose one of these for discussion and I might want to refresh my memory. Or I could just decide that I'm in the mood for that particular book ... Stranger things have happened. As of right now, though, I don't really have any desire to read any of these books again. It took me about six months to get through this book when I read it ten years ago. It was an extremely challenging book on many levels, and I don't know that I have the patience to read it again in the future. That being said, it's still one of the most unique and interesting things I've ever read, and I plan to keep my copy (so there's always a chance I'll change my mind one day and read it again). I've been a fan of Sylvia Plath's work since I first read one of her poems back in college, so it's not too surprising that I enjoyed reading this collection of her personal journals. This was another book that took me months to get through, mostly due to the intensely personal way so much of it touched me. It was emotionally exhausting. There's a lot to be said about reading the right book at the right time, and this was very much one of those "right time" books. I'm not sure it would have the same emotional impact if I read it now, and that's the main reason I may never reread it. I enjoy reading the occasional true crime book, and Helter Skelter is my absolute favorite in this genre. It was written by the prosecuting attorney in the Charles Manson murder trials, so the research is extremely thorough and allows the reader a very in-depth look at everything that happened. While it was fascinating, it was still true crime -- and I just don't really feel the need to reread books that fall under that category. I've learned what I could, so it's time to move on. I've watched the movie version many times (probably too many since I tend to quote it sometimes), but I don't know that I could stomach the book a second time. There are plenty of things in the book that never made it into the movie (for good reason) that I still cannot get out of my head. (I read this book twelve or so years ago, by the way.) When words on a page are that powerful, that's damn good writing ... But I still don't have any desire to pick it up again any time soon (if ever). Although I hated the ending, I gave this book a five star rating when I read it three years ago. The story was so captivating that I just couldn't put it down -- I had to know what was real and what wasn't. It surprised me that I enjoyed it so much since there are a lot of magical/supernatural elements (and I usually hate that). It's a book I still think about from time to time. Unfortunately, this is another book that's not really worth reading multiple times ... Once you know what happens, it won't have the same effect. Like most people, I really enjoyed The Martian. I flew through it in a couple of days and quickly began recommending it to others. The thing is, I don't think I'd enjoy it as much the second time around. It's not necessarily a suspenseful book, but there's enough uncertainty that any subsequent reads would be spoiled by the knowledge of what happens in the end. I still haven't seen the movie (and I'm not opposed to seeing it in the future), but I really have no interest in reading the book again. This book made it onto a list I shared of some of my favorite thrillers. But, as much as I enjoyed reading it, the thing that made it worthy of that list was the fact that it offered some great twists I never saw coming. There have been very few books that have managed to take me so completely by surprise, and reading this book again would mean losing what made it so amazing the first time. I remember really liking this book when I read it a few years ago (though it's still the only Jodi Picoult book I've read). One of the main reasons I enjoyed it was the storytelling: pieces of the puzzle were revealed throughout the book until the reader could finally see the whole picture and understand exactly what happened. Because of this, I think reading it multiple times would be disappointing -- there would be no mystery left. I absolutely loved this book, and it stuck with me long after I'd finished the last page. Very few books have made me cry as much and for as long as The Nightingale -- and that's exactly why I'll probably never read it again. I love books that make me feel real emotion, but those books are also tricky to reread because they almost never produce the same feelings.